Baby #2 is on the way. 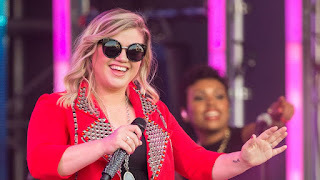 There are a couple times during Kelly Clarkson’s current summer tour where she gets a little emotional while setting up a song that has special meeting. But when she got to “Piece By Piece” in Los Angeles on Wednesday night, well, not only did she get weepy, she also made a confession: she’s pregnant! “I’m totally pregnant” she told the audience about expecting her second kid with husband Brandon Blackstock, according to USA Today. She wasn’t really planning on the big reveal (heck, she hasn’t even told some of her family members yet), but the tears she was shedding while singing very personal lyrics like, “I would never leave her like you left me/She will never have to wonder her worth/Because unlike you, I’m gonna put her first,” just put her over the edge. Clarkson, 33, gave birth to her daughter River Rose last summer and she said the combination of the autobiographical lyrics (which she has said describe aspects of her childhood) and well, the things that happen when you’re preggeers overwhelmed her. “I’m honestly so hormonal today,” she told the Staples Center crowd. “That’s totally not how I wanted to announce that… We’ve told our family. Well, some of them. But I was crying and I didn’t want you to think I was crazy.” mtv news.